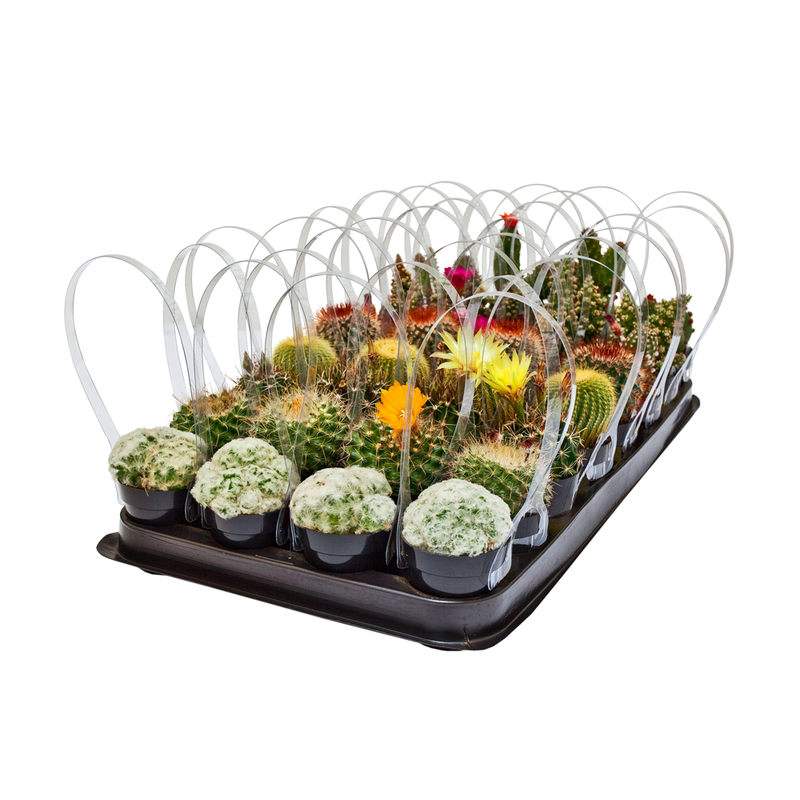 Create modern centerpieces, gift favors, or a bridal bouquet with living mini cactus and succulent plants! 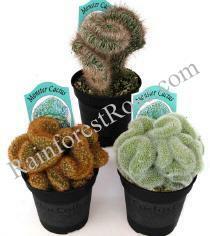 Over 200 species of Cacti and Other Succulents are available! Choose a collection, each collection will consist of assorted plants in its genus (category), in 2.5" inch or 3.5" inch pots. The larger the pot size, the more expensive, and thus you will receive less number of pots. 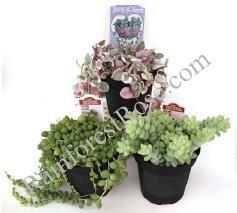 Varieties are growers choice and will come with standard plastic pots with soil and nursery name tags. Click picture to enlarge the photo. Then please submit payment on Step#3. 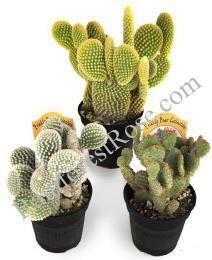 Assorted Cacti of the round and clumping varieties, no columnar cacti are included in this assortment. All varieties are labeled with genus and species as well as a colorful care tag. The collection offers excellent texture, color, and quality. All plants are California grown from seed or cuttings in our greenhouse and fields in North San Diego County. Assortments change weekly with plant availability. 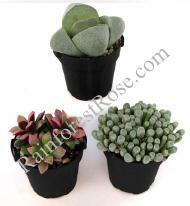 Jade are members of the Crassula family. Many varieties of Jade exist, including Mini Jade with its tight, compact leaves; 'Hobbit' and 'Gollum' or "Fingers" Jade, with their elongated, tube-like leaves;' Ruby' Jade with its red-edged leaves and 'Sunset' Jade, with its yellow tricolor leaves. Pink Jade is a variety that has a sought-after rosy pink flower that blooms in November and December. 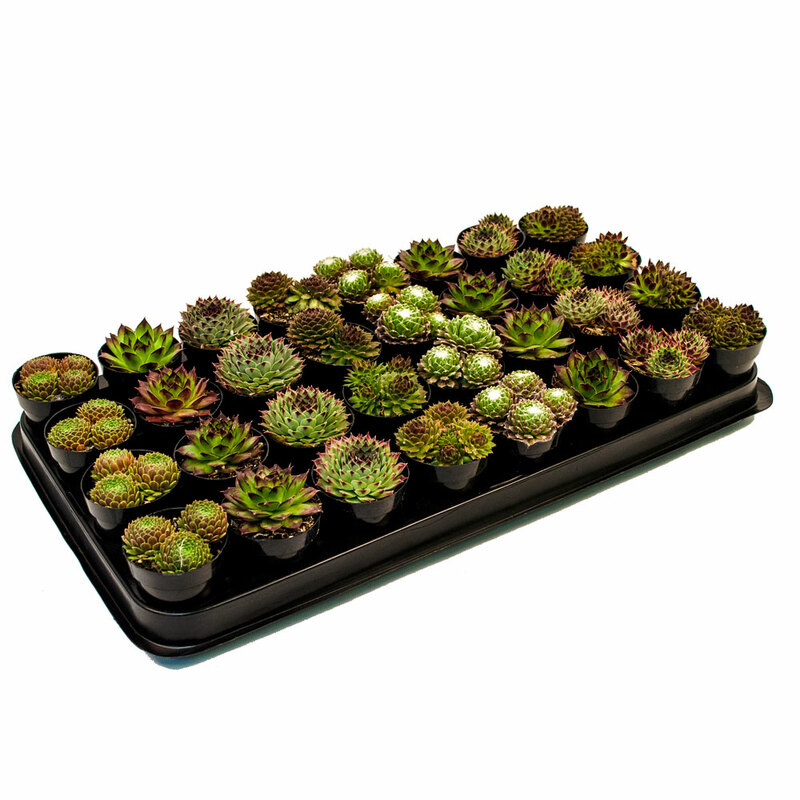 Sempervivums range from tiny mat-forming types to rare tree types. They make excellent rockery, dish garden or pot plants. Many of these plants are cold hardy. They like to be moderately moist but never overly wet. Almost any good potting mix will suit these succulents. Sempervivums all like good air circulation. Little or no fertilizer is required. Most like partial sun to light shade outdoors. They will be unhappy and lose their characteristic color and shape unless given lots of bright light when kept indoors. Crested Cactus are cacti that are rare freaks of nature that occur when the growing tip multiplies and the stem begins to "go crazy", forming undulating "fan" shapes that can give the appearance of "brains". 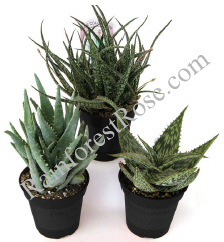 Aloe are native to Africa and come in all sorts of colors and can grow from 2 inches to 5 feet tall. The graceful spikes of orange or reddish tubular flowers are a special treat for hummingbirds. Assorted Crassulas, Echeverias, Kalanchoes, Sedums, Aeoniums, & Aloes. All varieties are labeled with genus and species as well as a colorful care tag. The collection offers excellent texture, color, and quality. All plants are California grown from seed or cuttings on our acres of greenhouse and fields in North San Diego County. 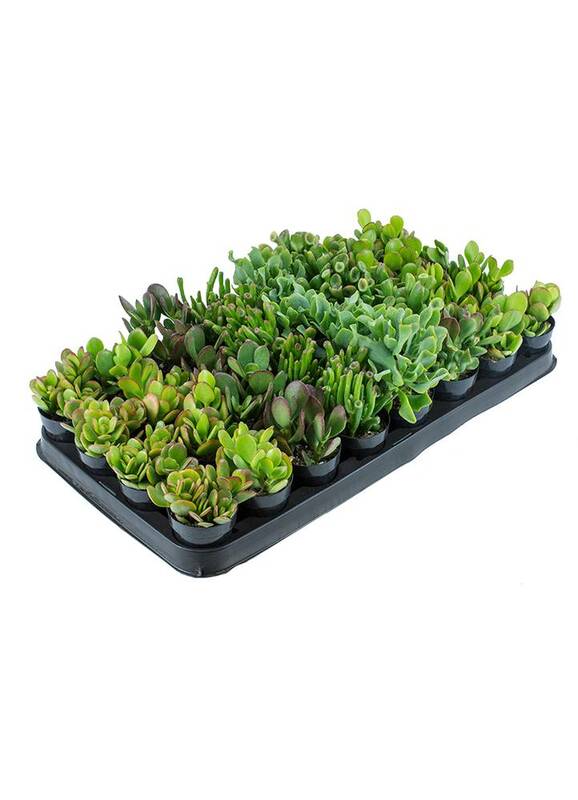 Assortments change weekly with plant availability. 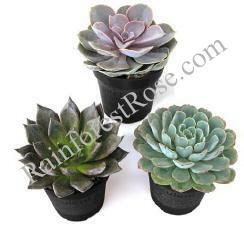 Echeveria have succulent leaves that grow like petals of a rose. Colors vary from ruby-glow black, grass-green, icy blues, frosty iolets or nearly iridescent pastels. Drought tolerant. So named for their ability to mimic other items in nature like stones and pebbles, these succulents would be found nearly buried with the items that they are imitating as a method of survival. Monster Cactus are sometimes confused with "crested cacti" but differ in that the stem does not form fan shapes; rather the stem seems to "sprout" many new growing tips, resulting in a "bizarre" appearance. Gymnocalycium mihanovichii are actually two plants grafted together. The upper, colorful cacti are born without chlorophyll, they are not green like other plants but can occur in hues of orange, yellow/orange, pink, or bright ruby red. This portion is grafted to a green Hylocereus species to provide the needed chlorophyll for photosynthesis. Gymnocalycium mihanovichii friedrichii is commonly known as 'Hibotan' or "Moon Cactus". This variant occurs when the plant lacks chlorophyll and the body color manifests as beautiful pink,orange, yellow, or red rather than the typical green. Pink is not the only "chlorophyll" color that occurs; in fact, many beautiful seedlings are born in many genera that are yellow, pink, orange, or many combinations of these colors. "Moon Cactus" is an excellent subject for windowsill culture. 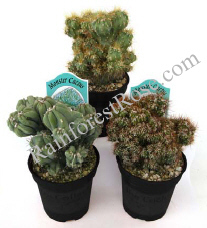 Requires porous cactus soil with adequate drainage. Type: root established in their pots/soil. Display tray included. Name labels: picture name tags included. Ship to: 50 USA, no overseas destination. No return. No PO Box. A collection of many varieties of assorted Adromischus, Aloe, Anacampseros, Cotyledon, Crassula, Cremnosedum, Echeveria, Graptosedum, Gymnocalycium, Haworthia, Kalanchoe, Notocactus, Pachyveria, Portulacaria, and Sedum. Pot size: 2.5 inch nursery plastic pots. Additional plants: contact us to order. Name labels: species name and care direction included. 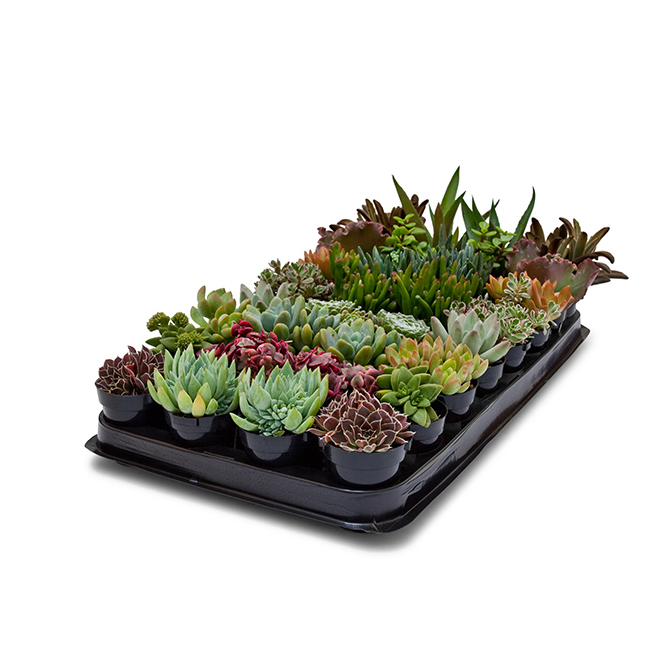 This potted collection will ship in tray for maximum protection. Pot size: 3.5 inch nursery plastic pots. Assorted Notocactus, Mammillaria, Opuntia, Echinocactus, Ferocactus, Pilocereus. All varieties are labeled with genus and species as well as a colorful care tag. The collection offers excellent texture, color, and quality. All plants are California grown from seed or cuttings in our greenhouse and fields. Assortments change weekly with plant availability. Pot diameter sizes: 9cm (3.5 inches), 6 cm (2.5 inches). Rule of thumb: the bigger the diameter, the larger the plants. Color: various textures and colors. Type: established in their pots/ soil and properly labeled. Signature confirmation is required at delivery. Someone MUST BE available on Delivery Day to receive and sign for the merchandise. If someone is not available for delivery and the packages sit over the weekend without a signature for delivery that will be the customer's risk. Succulents and Cactus as low-water using plants to promote water conservation for your landscape. 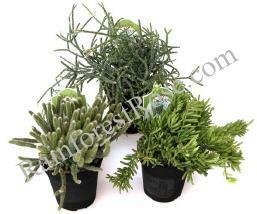 Our products are sold in bulk and wholesale prices which are 50% discount or more from nursery. 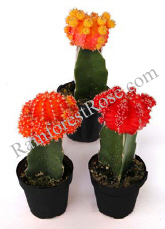 We believe you will enjoy wide variety and quality of our plants. Incorporating a Water-Less concept into your landscape and garden helps to reduce your use of water, our precious natural resource, and allows your garden to grow in rhythm with its natural environment. Prickly Pear are Opuntia cacti with paddles, sometimes known as beaver-tail cactus and some varieties are considered a food source by indigenous cultures. Sempervivum form clusters of geometric rosettes, some with interlaced silken hairs with the appearance of cobwebs. These plants are cold and drought tolerant. String of Hearts, Sting of Pearls and Burrito’s Tails are favorite hanging succulents. Jungle Cactus, unlike their desert cousins, they live as epiphytes (hang on to something, not feed off of it like parasites) high in the trees of steamy jungles.